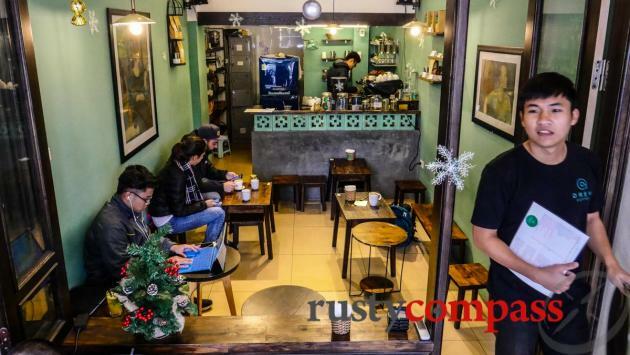 A guide to Hanoi’s best coffee.These cafes are cool little destinations too. Make them part of your Hanoi exploration. 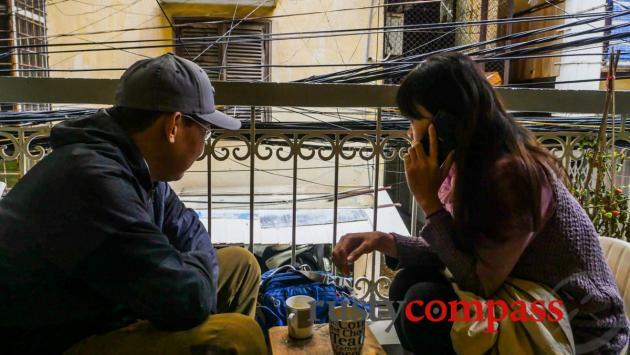 Vietnam’s traditional coffee culture is more developed and visible in Hanoi than anywhere else in the country. You never have to look far to see clusters people of all ages sipping the local dark drip stuff - ca phe phin. More recent fads like egg coffee also hail from Hanoi. 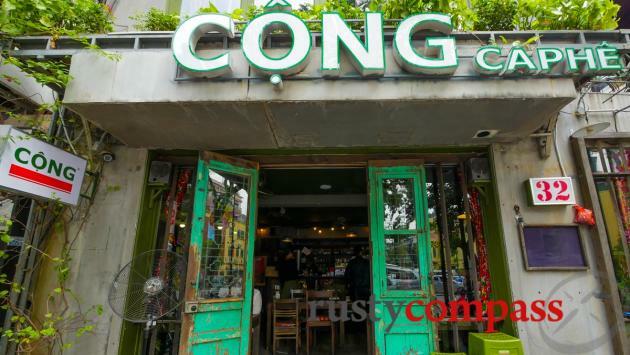 And one of the country’s most successful new cafe franchises, Cong Caphe, is also a Hanoi native. Ca phe den nong (hot black coffee), ca phe den da (ice, black coffee), cafe sua da (ice coffee with sickly sweet condensed milk) are essential to the Hanoi coffee vocab. Hanoi has been slower to embrace the espresso-style specialty coffee scene that’s booming in Saigon. The catch-up is on. This guide is focused on coffee houses specialising in espresso-style coffee. These guys get their beans from Vietnam’s coffee region in the Central Highlands. So it's a Vietnam coffee experience with international touches. We’ll also point you in the direction of more traditional coffee options. 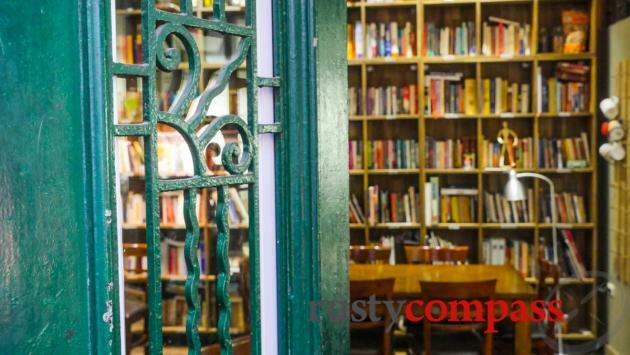 This super cute little place serves great coffee in a space that looks more like a library. Books line the walls. It’s quiet inside. Good place to get some work done. A perfect Old Quarter stop for coffee, people watching and local life. Pull up a stool out the front and watch Hanoi pass by. There’s a small local market on the street and the space has a cool old Hanoi feel. Despite being in the heart of the tourist precinct, Cafe Cho still pulls in plenty of young local customers. 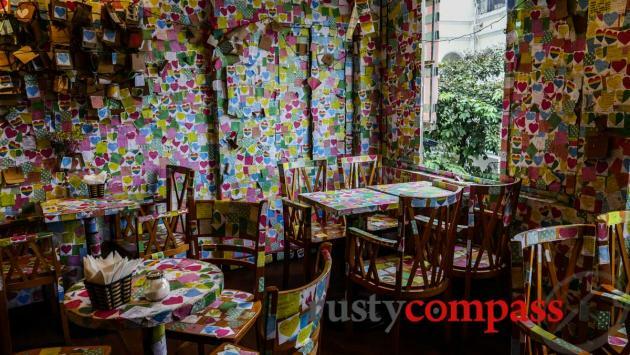 It’s a little strange that 3 of our favourite Hanoi coffee stops have a single owner. 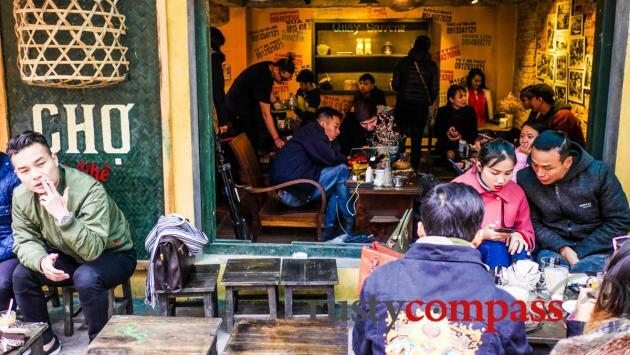 We see a bit of this in Hanoi - restaurants, bars and cafes all from a small group of owners. Blackbird Cafe is another spot from the guys behind Tranquil Cafe and Vui Studio (both already in this list). These guys are coffee obsessed. And they know how to create interesting spaces too - each with its own design character. Blackbird’s a cosy spot on a great Old Quarter street for serious and not-so-serious coffee folk. It’s right opposite one of the coolest old mansions in the capital too. And a cafe named after one of the Beatles best tunes is off to a good start. 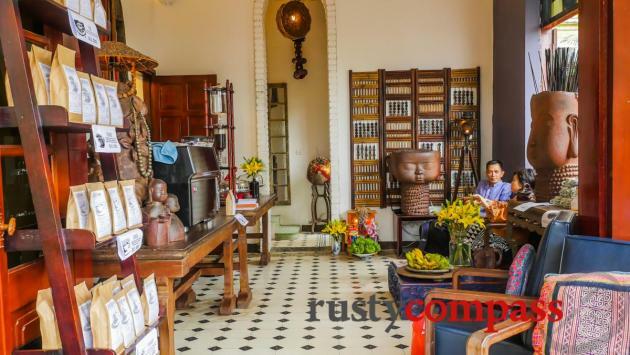 Muoi Tieu Cafe opened in 2018 in a French villa and leafy courtyard down a Hanoi lane. Thanh, the chef and one half of couple who runs the show, spent nine years working in Sydney before applying his cafe smarts in his home town. Hailing from coffee loving Hanoi and spending years in Sydney’s cafe scene has worked a treat. This a cool and friendly spot for Vietnamese or espresso-style coffee. Reng Reng felt like a coffee cult during our only visit on a wet winter’s day. Delicious brew. Not a terribly warm welcome - but worth it. Hidden away down an alley on the fringe of the Old Quarter. Setting up in one of Hanoi’s most picturesque (in 2019 read Instagrammable) crumbling colonial villas gives Rolling T a head start in the atmosphere department. Head into this grand piece of fading Hanoi history for local coffee, teas and juices. Strange name choice for a Vietnamese cafe - great coffee. Drew became a regular haunt during recent Hanoi visits. It’s close by some favourite parts of the Old Quarter where I often stay. Having a very long name is not the only thing that is special about this new cafe and coffee house overlooking Hanoi’s West Lake. Eastern and Oriental had only just opened during my visits so expect food and more to come online soon. The coffee and the space already make it a worthwhile stop. Located in the Hanoi West Lake area, around 15 minutes from downtown. Maison d Tet Decor is a perfect escape from the bustle of downtown - the coffee’s a bonus. Apart from good coffee, roasted onsite, Maison de Tet Decor also serves great food in a cool design space. They moved to new digs at the address below in early 2019. 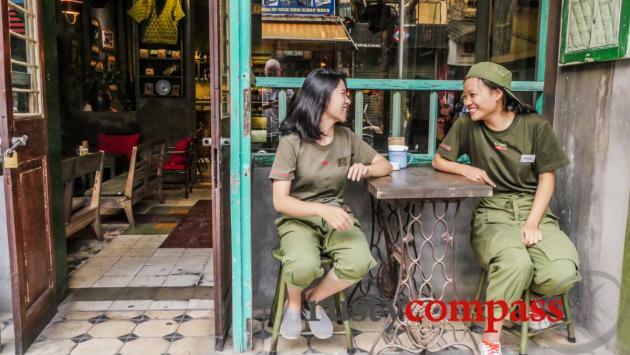 Vietnam’s coolest coffee chain, the military themed Cong Caphe, is everywhere in Hanoi. You’ll never walk far without colliding with one. Cong's distinctive military green colours cover some of the city’s coolest spaces. A good spot for some traditional ca phe phin drip coffee. Cong Caphe is everywhere in Hanoi. We’ve marked up a couple we think are especially cool as locations. 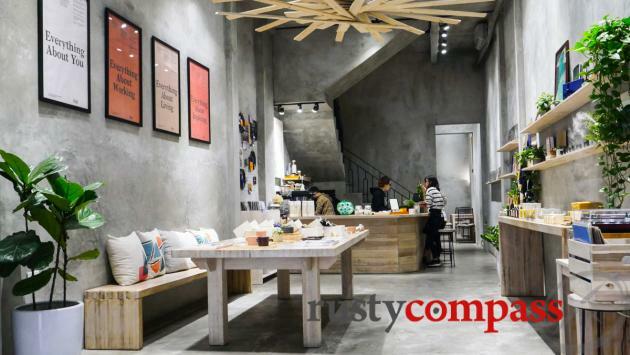 A concept store in Japanese minimalist style with a little cafe out the back. It's from the same owner as Tranquil (above). Good coffee and a good little work space. Impeccable toilets! Hanoi’s egg coffee craze is a relatively recent phenomenon - though egg coffee has existed in the capital for decades. Lots of places are selling this sweet brew now (it’s too sweet for me) but legend has it that Cafe Giang is where the concoction was first cooked up. And it’s still a popular spot. The Note Cafe, close by Hoan Kiem Lake, is in on the act now too and also sees lots of travellers in need of a sugary, eggy caffeine hit. Loads of other places have also adopted this newish Hanoi specialty. This stuff’s everywhere. It’s strong and it’s bitter. But the edge is usually neutralised by the sweetness of the condensed milk it’s mixed with. And the condensed milk is super sweet. Trieu Viet Vuong At, away from the Old Quarter, is a strip of local cafes for the serious traditional coffee explorer. But you’ll never be far away from this stuff. The Cong Caphe version is perfectly drinkable too. Rusty Compass listings are always independent. We show you the places we think you should know about. That’s it. We paid our way at all places listed here and no money changed hands for a space in this list.